What Is Jet Lag? How Do You Fight It? Jet lag is something that every traveler has to deal with. It's whole different thing to get your body to change the same number of time zones. They're all part of a real physical reaction. Your biological clock is upset when you travel rapidly across many time zones. Now your watch and your brain are trying to tell it something different.... your body is lagging behind. Crossing one or two time zones usually doesn't cause jet lag. At least we haven't experienced it with short flights. There really isn't enough of a time change there to really disrupt your biological clock. And it's not linked just with the length of the flight. 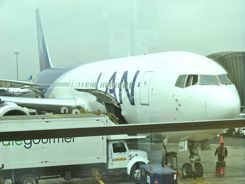 Long north-south flights that don't cross time zones may leave you tired, but not jet lagged. That makes you tired and grumpy, but those long north-south flights won't disrupt your sleep pattern. Jet lag is more than just flight fatigue. You're supposed to eat and sleep on a whole different schedule. You may have digestive upsets.... and that can be either constipation or diarrhea. And you will definitely have problems with your sleeping patterns the first day or two or more depending on how susceptible you are. If you went by a slower means of transportation, it would be easier.... a horse drawn wagon maybe? OK, that's not realistic, but if you went by ship, you would cross those time zones more slowly and your body could catch up gradually. Your body will catch up with that plane ride too... it just takes a few days. A horse drawn wagon maybe? But if you went by ship, you would cross those time zones more slowly, and your body could catch up gradually. 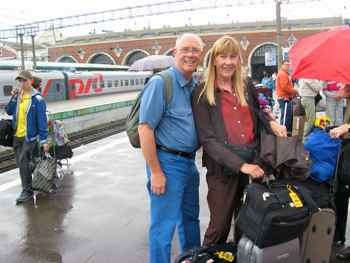 We took the Trans-Siberian Railroad from Saint Petersburg, through Mongolia and to Beijing. It was a long trip... lots of fun... and NO jet lag. Your body will catch up with that plane ride too... it just takes a few days. What Can You Do To Counteract It? We really haven't tried any of the over the counter remedies. And we haven't tried to reset our biological clock before a trip. We just try to be sensible on the flight and get into action as soon as we can once we arrive... get out into the fresh air and stay away from museums for at least the first day. 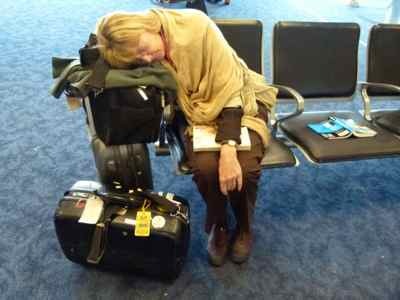 Basically we do what we tell you to do on our page about fatigue after flights. Try to avoid alcohol and caffeine. Try to eat balanced meals and avoid high fat. Do exercises in your seat... Check the back pages of those airline magazines in the seat back. To counteract that dry aircraft cabin air... I don't know if anyone else will tell you this, but I get a damp paper towel and breath through that. ...and even in those first couple of days, you can be out and about and having fun. Everyone feels that jet lag to some degree, even professionals and seasoned travelers... don't let them tell you otherwise. You can't fight it completely, but learn how your body reacts and what works best for you to recover, and soon you'll be on the right time zone and having a great time.